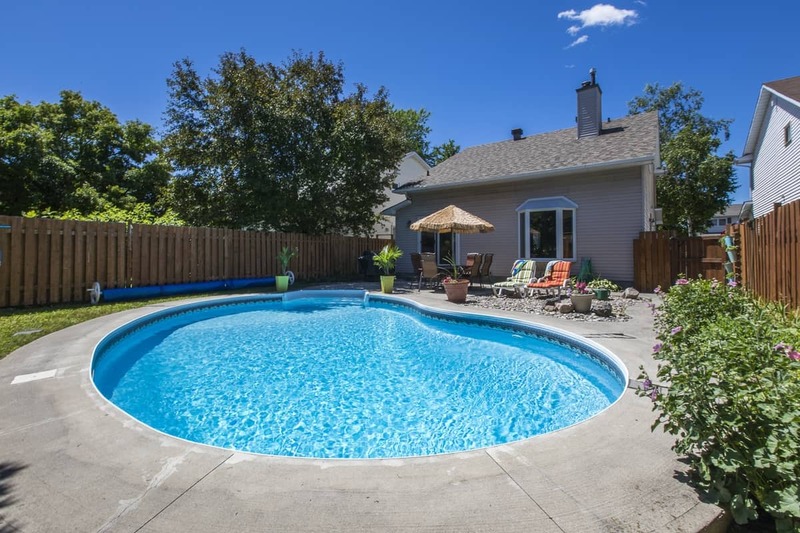 Come home to this beautiful home at the end of the day and fully relax in the backyard OASIS and your own in-ground Salt Water Swimming Pool. Click here to view the Photo Gallery or click the Play button on the Youtube video below! Featuring a spacious main floor with beautiful hardwood floors, a formal dining and living room at the front. The rear of the house is where the fun times begin! You’ve got a bright eat-in Kitchen with Quartz counter tops which opens on to a soaring 2-storey family room with wood burning fireplace, with both rooms overlooking the Pool! The backyard also includes a natural gas BBQ hookup and garden shed. A main floor powder room and side entrance/mud room with direct access to the attached garage completes the main floor. Upstairs you have three very large bedrooms including a huge Master with a fully renovated main bath with walk-in shower. The upstairs hall overlooks the family room which will keep you cozy in winter with a soaring two-storey fireplace. Downstairs you also have a fourth bedroom with it’s own 4 piece en-suite – perfect for a teen pad or in-law, a craft room and loads of storage space. Ready to move right in – with lots of updates – roof was completed in 2008 with 40 year Everest Fiberglass shingles, new furnace was installed in 2014! Click on the attachment below for more details such as room sizes and property taxes. Location Location Location – you’ve heard those words many times but they are true here as you’re nicely located on a quiet crescent at the near end of Orleans in a mature neighbourhood, so far less commute then most of Orleans and soon with the Light Rail Phase II – it will be even better as your new home will be a 10 minute walk to the Light Rail Station at the Jeanne D’Arc exit. It’s a well known fact that being less than 800 metres from a light rail station greatly improves property values.